Once again, God commissioned Jonah to go and preach in Nineveh. This time he obeyed God, preaching “Forty more days and Nineveh will be overturned.” This sermon is very odd, especially because of what is missing: there is no word about what they have done wrong or why they were in trouble, no solution offered, and no mention of God. Has Jonah intentionally given the bare minimum of information? Is he trying to sabotage the message? Even though the sermon was so terrible, the Word of God is powerful and effective. As soon as Jonah preached, the king of Nineveh, the entire city, and even the cows all repented in sorrow and ashes. The king called on the people to “turn from their evil ways” and he himself took off his royal clothing and the symbols of his power and sat down in the dust. For the second time, the evil heathens showed themselves to be more humble and responsive to God than God’s own prophet. Ironically, Jonah’s words did come true—the great city of Nineveh was ‘overturned’—just not in the way that Jonah expected or hoped. 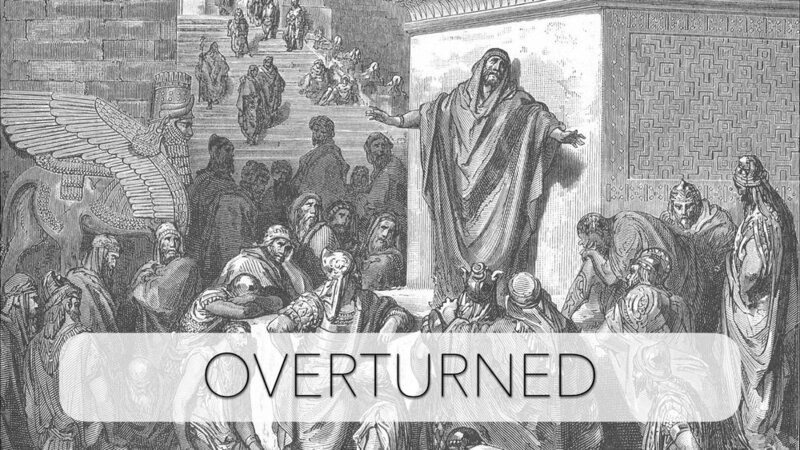 ‘Overturned’ can refer to a city being destroyed, like Sodom and Gomorrah were, but it can also be used to mean ‘transformation,’ something being turned over and changed into its opposite. That was the case for the Ninevites, who repented and found God’s mercy, and it is the case for us as well. Jesus took off his royal robes and sat down in the dust and ashes in our place, turning aside God’s fierce anger from us to himself. Christ’s saving acts are both the basis of God’s compassion and the climactic expression of it. By the power of the Holy Spirit, God’s Word has transformed us into our opposites—no longer enemies of God, but his dearly loved children.